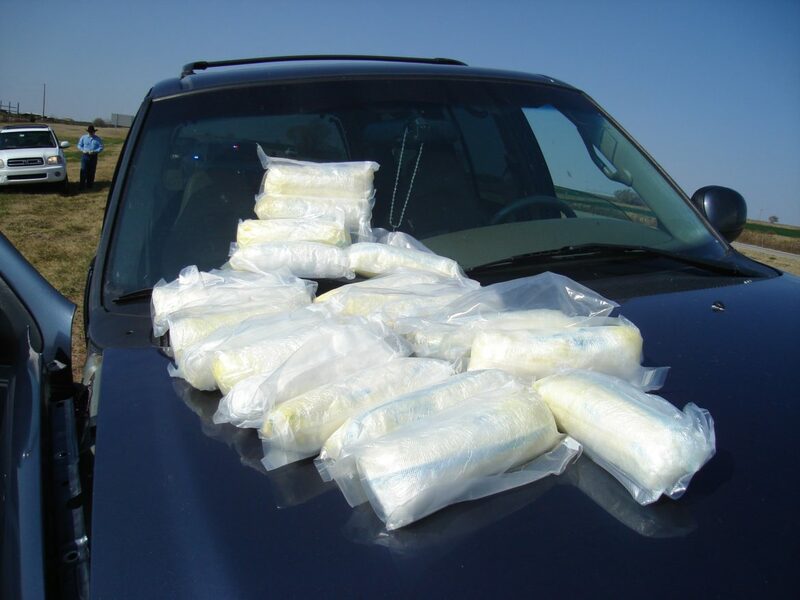 Bureau of Narcotics officers seized 20 pounds of meth during a 2015 stop along Interstate 40 in Canadian County. An Oklahoma Bureau of Narcotics and Dangerous Drugs Control analysis shows 952 people died from overdoses, and the number is likely to rise as pending autopsies are finalized. The total overdose deaths is well above the 862 recorded in 2015 and the previous record of 870 in 2014. Meth was involved in 328 of the deaths, climbing steeply from 271 in 2015 and surpassing the total combined deaths involving much-abused opioids hydrocodone and oxycodone. Opioids remain a potent threat, however. As a group, they were involved in more fatal overdoses than meth last year. Fatal heroin overdoses continued to surge, with the drug involved in 49 deaths in 2016, up from 31 in 2015. Other states have seen larger increases in deadly heroin abuse. The Narcotics Bureau said its numbers derive from its running collection of autopsy results from the Office of the Chief Medical Examiner. Narcotics Bureau spokesman Mark Woodward attributed the meth-related deaths partly to the growing use and continued availability of the drug. Oklahoma’s high rates of mental illness and addiction, along with crackdowns on opioid prescribing, have made the state a ready market for a form of meth, called “ice,” provided by Mexican cartels. The living-room meth labs of the previous decade are less common now, with discoveries of labs decreasing dramatically, Woodward said. Instead, meth comes from “super labs” in Mexico and along the U.S.-Mexico border. People who once would have cooked small amounts of meth to sell and use now steal or barter to feed their habits. “It’s cheap, it’s accessible and someone in your circle will have it if you’re using drugs,” he said. Changes in law have helped decrease opioid overdoses, health officials say. A 2015 law requires doctors to check the state’s Prescription Monitoring Program database before prescribing opioids and benzodiazepines, such as Xanax, to new patients. A 2014 reclassification of combination opioids, such as Lortab, which includes hydrocodone and acetaminophen, into Schedule II controlled dangerous substances, prohibits doctors from writing prescriptions for more than 90 days and phoning them in to pharmacies. 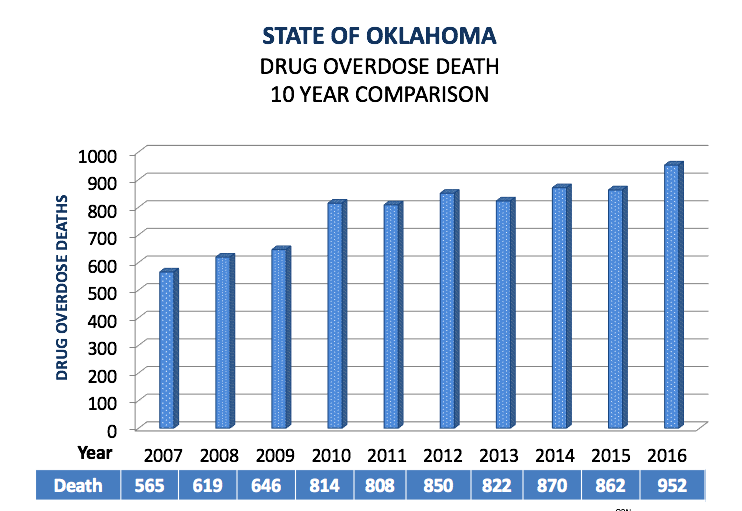 Jeff Dismukes, spokesman for the Oklahoma Department of Mental Health and Substance Abuse Services, said the declining number of opioid-related deaths also corresponds with lives saved from administering opioid-blocking Naloxone. However, prescription drug overdoses remain a scourge. Jessica Hawkins, prevention director for the Mental Health Department, cautioned against oversimplifying potential links between meth and prescription drug abuse. A drop in one doesn’t necessarily lead to an increase in the other, she said. Hawkins said potential causes include increased strength of methamphetamine, manner of taking the drug (IV users are more likely to suffer an overdose), using meth with other substances, and multigenerational use in some families. Woodward said there is no way to know if the hundreds of Oklahomans who died from meth overdoses were regular users or were shifting from prescription opioids to meth. Autopsies and medical examiner reports only determine what was in a person’s body at the time of death, or if responders found drugs or paraphernalia nearby. Also, many people who die from drug overdoses have taken multiple drugs, although the Narcotics Bureau counts them according to the main drug found in their systems. “When you’re an addict, you’ll take what you can get. … They all have their drug of choice, but they’re not exclusive to that drug,” he said.